He's been voted Wired magazine's sexiest geek, his YouTube channels regularly draw more viewers than certain broadcast networks and he's close chums with Sharkzilla. 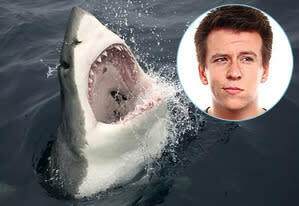 He's Internet celeb Phil DeFranco, and he's hosting Shark Week's 25 Best Bites countdown Thursday (10/9c, Discovery). So we tossed out a few questions to him about the finned wonders being featured in the 25th anniversary special and guess what? He took the bait! TV Guide Magazine: OK, so 25 Best Bites...how were these chosen? Phil DeFranco: It's generally in order of awesomeness. A lot of the top ones are the newer ones because of the hi-def footage and the slo-mo cameras. I think people are going to enjoy all of them, but if you are new to Shark Week, it brings you in. And if you are an old-timer, than you will watch and be like "Oh I remember that!" TV Guide Magazine: Had you been a watcher? DeFranco: I was around 12-years-old when my dad would let me watch it...i think he did that just to give me nightmares. We bonded over being terrified. Then it became something I would watch with my friends every year. TV Guide Magazine: Have all of those years of Shark Week scares changed the way you feel about going into the ocean? TV Guide Magazine: Have you gotten to visit places like Seal Island or the shark-infested section off the South African coast? DeFranco: Not yet. I'm hoping the special does really well and they invite me back for some caged shark awesomeness. TV Guide Magazine: Do you have any favorite on-screen sharks? DeFranco: Oh, who was that guy from Finding Nemo? "Fish are friends, not food." What was his name? TV Guide Magazine: Bruce! I was always fond of Jabberjaw. Oh, and the super-smart sharks from Deep Blue Sea. TV Guide Magazine: So what's next for you? DeFranco: My big thing is everything Internet. This was fun because I got to be a part of something that I have been watching since I was a kid and really loved. It's amazing that this was my first taste of TV. But my heart and soul exists online, so we're just focusing on making new channels. I have a news show, we started up a news network, so I'm just going into that non-scripted world. I'm not actually a host, like I am with this Shark Week stuff. I'm mainly Internet stuff. TV Guide Magazine: Have you been checking in to GetGlue to get your daily Shark Week stickers? DeFranco: I have not! But I have been watching with everyone on Twitter and talking with everyone...it's been great.